Tokyo (東京, Tōkyō, historically Tōkei ?, literally "Eastern capital") listen is the seat of the Japanese government and the Imperial Palace, the home of the Japanese Imperial Family, and the de facto capital of Japan. About 35 million people live in the Greater Tokyo Area which encompasses Tōkyō-to and surrounding prefectures, making it the world's most populous metropolitan area. Long a symbol of Tokyo, the Nijubashi Bridge at the Imperial Palace. The general public is allowed to cross this bridge on two days of the year: New Year's Day and the Emperor's birthday on December 23 to greet the Imperial family appearing on a balcony. After 263 years, the shogunate was overthrown under the banner of restoring imperial rule. In 1869, the figurehead 17-year-old Emperor Meiji moved to Edo, which was renamed "Tokyo" ("Eastern Capital") the year before. Tokyo was already the nation's political, economic, and cultural centre, and the emperor's residence made it a de facto imperial capital as well with the former Edo Castle becoming the Imperial Palace. The city of Tokyo was established, and continued to be the capital until it was abolished as a municipality in 1943 and merged with the "Metropolitan Prefecture" of Tokyo. Stone foundation of the main tower at Edo Castle. Tokyo, like Osaka, has been designed since about the turn of the century (1900) to be rail-centric, that is centered around major train stations in a high density fashion, so suburban railways were built relatively cheaply at street level. This differs from other world cities such as Los Angeles that are low density automobile centric, and though expressways have been built, the basic design hasn't changed to this day. Tokyo went on to suffer two major catastrophes and has recovered remarkably from both. One was the Great Kanto Earthquake in 1923, and the other was World War II. The firebombings in 1945 were almost as devastating as the atomic bombs of Hiroshima and Nagasaki combined. Large areas of the city were flattened. After the war, Tokyo was completely rebuilt, and showcased to the world during the city's 1964 Summer Olympics. Tokyo became the largest city in the world in 1965 (taking the lead from New York). The 1970s brought new high-rise developments such as Sunshine 60, a new and controversial airport at Narita (well outside Tokyo), and a population increase to about 11 million (in the metropolitan area). Tokyo's subway and commuter rail network became the busiest in the world as more and more people moved to the area. In the 1980s, real estate prices skyrocketed during an economic bubble: many got rich quick, but the bubble burst in the early 1990s and many companies, banks, and individuals were caught with real estate shrinking in value. A major recession followed, making the 1990s Japan's " lost decade" from which it is now slowly recovering. Tokyo still sees new urban developments on large lots of less profitable land. Recent projects include Ebisu Garden Place, Tennozu Isle, Shiodome, Roppongi Hills, Shinagawa (now also a Shinkansen station), and Tokyo Station (Marunouchi side). Buildings of significance are demolished for more up-to-date shopping facilities such as Omotesando Hills. Land reclamation projects in Tokyo have also been going on for centuries. The most prominent is the Odaiba area, now a major shopping and entertainment centre. Tokyo was hit by powerful earthquakes in 1703, 1782, 1812, 1855 and 1923. The 1923 earthquake, with an estimated magnitude of 8.3, killed 142,000 people. There have been various plans proposed for transferring national government functions from Tokyo to secondary capitals in other regions of Japan, in order to slow down rapid development in Tokyo and revitalize economically lagging areas of the country. These plans have been controversial within Japan and have yet to be realized. Flag of Tokyo. The sun is a stylized Kanji character of Tokyo-Nihon, which represents the developing capital city Tokyo. Adopted October 1, 1964. This map shows the mainland portion of Tokyo. Colors indicate the twenty-three special wards and Tama. About 249 sq km of reclaimed land on Tokyo Bay (such as Odaiba) has been omitted for clarity. The islands cannot be shown at this scale. Tokyo Metropolis consists of three major parts: the twenty-three special wards (constituting the former Tokyo City); Tama area; and the islands. The mainland portion of Tokyo lies northwest of Tokyo Bay and measures about 90 km east to west and 25 km north to south. It borders Chiba Prefecture to the east, Yamanashi Prefecture to the west, Kanagawa Prefecture to the south, and Saitama Prefecture to the north. Mainland Tokyo is further subdivided into the special wards (occupying the eastern half) and the Tama area (多摩地方) stretching westwards. Also within the administrative bounaries of Tokyo Metropolis are two island chains in the Pacific Ocean directly south: the Izu Islands, which are almost parallel to the Izu Peninsula; and the Ogasawara Islands, which stretch more than 1,000 km away from mainland Japan. Under Japanese law, Tokyo is designated as a to ( 都, often translated " metropolis"). 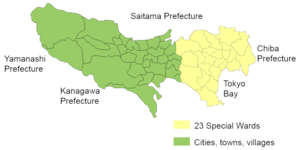 Its administrative structure is similar to that of Japan's other prefectures. Within Tokyo lie dozens of smaller entities, most of them conventionally referred to as cities. It includes twenty-three special wards (特別 区 -ku) which until 1943 comprised the city of Tokyo but are now separate, self-governing municipalities, each with a mayor and a council, and having the status of a city. In addition to these 23 municipalities, Tokyo also encompasses 26 more cities ( 市 -shi), five towns ( 町 -chō or machi), and eight villages ( 村 -son or -mura), each of which has a local government. 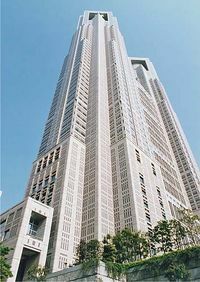 The Tokyo Metropolitan Government is headed by a publicly-elected governor and metropolitan assembly. Its headquarters are in the ward of Shinjuku. They govern all of Tokyo, including lakes, rivers, dams, farms, remote islands, and national parks in addition to its famous neon jungle, skyscrapers and crowded subways. Tokyo Metropolitan Government Building in Shinjuku. 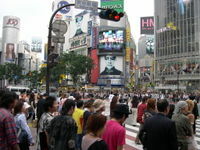 The world's busiest pedestrian crossings, the scramble crossing in front of the Hachikō exit of Shibuya station. The special wards (tokubetsu-ku) of Tokyo comprise the area formerly known as Tokyo City, usually simply known as "Tokyo". In July 1, 1943, Tokyo City was merged to Tokyo Prefecture (until June, 1943) (東京府, tokyo-fu), lost municipality status and was divided into wards. Each ward is a local municipality with its own elected mayor and assembly, differing from an ordinary city in that certain governmental functions are handled by the Tokyo Metropolitan Government, and, for most, also differing in having no particular centre and little cultural or similar distinctiveness from the immediate surroundings. As of September 1, 2003, the official total population of the special wards combined was about 8.34 million, with a population density of 13,416 persons per square kilometer. Location of the Tokyo Metropolitan Government Building. The area is best known for Tokyo's early skyscrapers, erected in the 1970s. Major department stores, electronics stores and hotels can also be found here. On the east side of Shinjuku Station, Kabuki-cho is notorious for its many bars and nightclubs. Shinjuku Station moves an estimated three million passengers a day, making it the busiest in the world. The main financial and business district of Tokyo has many headquarters of banks, trading companies and other major corporations. The area is seeing a major redevelopment with new buildings for shopping and entertainment constructed in front of Tokyo Station's Marunouchi side. Major shopping and entertainment district with department stores, upscale shops selling brand-name goods, and movie theaters. An area revitalized by being the gateway to Odaiba and the new Shiodome Shiosite complex of high-rise buildings. In addition to the major hotels on the west side of Shinagawa Station, the former sleepy east side of the station has been redeveloped as a major centre for business. A long-time centre of shopping, fashion and entertainment, especially for the younger set. Shibuya is also home to some of Tokyo's largest and newest nightclubs. The busiest interchange in north central Tokyo, featuring Sunshine City and various shopping destinations. Ueno Station serves areas north of Tokyo from where many people commute. Besides department stores and shops in Ameyoko, Ueno boasts Ueno Park, Ueno Zoo and major national museums. In spring, Ueno Park and adjacent Shinobazu Pond are prime places to view cherry blossoms. A large, reclaimed, waterfront area that has become one of Tokyo's most popular shopping and entertainment districts. The political heart of Tokyo and the nation. It is the location of the Diet, government ministries, and party headquarters. A district with a range of restaurants, clubs and hotels; many pedestrian alleys giving it a local neighbourhood feel. Next to Roppongi, Nagatacho, and Aoyama. A neighbourhood of Tokyo with parks, an enormous cemetery, expensive housing, trendy cafes and international restaurants. Includes the Omotesando subway station. 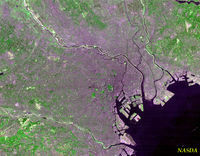 Satellite photo of Tokyo taken by NASA's Landsat 7. While serving a role as " bed towns" for those working in central Tokyo, some of these also have a local commercial and industrial base. Collectively, these are often known as Tama Area or Western Tokyo. The Tokyo Metropolitan Government has designated Hachioji, Tachikawa, Machida, Ome and Tama New Town as regional centres of the Tama area, as part of their plans to disperse urban functions away from central Tokyo. The far west is occupied by the district (gun) of Nishitama. Much of this area is mountainous and unsuitable for urbanization. The highest mountain in Tokyo, Mount Kumotori, is 2,017 m high; other mountains in Tokyo include Mount Takasu (1737 m), Mount Odake (1266 m), and Mount Mitake (929 m). Lake Okutama, on the Tama River near Yamanashi Prefecture, is Tokyo's largest lake. 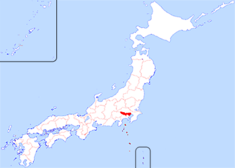 The Izu Islands (south) are part of Tokyo Prefecture. Tokyo's outlying islands extend as far as 1850 km from central Tokyo. Because of the islands' distance from the city, they are locally run by branches of the metropolitan government. Most of the islands are classified as villages. Ogasawara— Ogasawara includes, from north to south, Chichi-jima, Nishinoshima, Haha-jima, Kita Iwo Jima, Iwo Jima, and Minami Iwo Jima. Ogasawara also administers two tiny outlying islands: Minami Torishima, the easternmost point in Japan and at 1,850 km the most distant island from central Tokyo, and Okino Torishima, the southernmost point in Japan. The last island is contested by the People's Republic of China as being only uninhabited rocks. The Iwo chain and the outlying islands are uninhabited, except of Japanese Self-Defense Forces personnel. Local populations are only found on Chichi-jima and Haha-jima. Fuji-Hakone-Izu National Park, which includes all of the Izu Islands. Ogasawara National Park. As of 2006, efforts were being made to make Ogasawara National Park a UNESCO natural World Heritage Site. Tokyo has the largest metropolitan economy in the world: its nominal GDP of around US$1.315 trillion is greater than Canada's economy, which is the 8th largest in the world. It is a major international finance centre, is site of the headquarters of several of the world's largest investment banks and insurance companies, and serves as a hub for Japan's transportation, publishing, and broadcasting industries. Tokyo was rated by the Economist Intelligence Unit as the most expensive (highest cost-of-living) city in the world for 14 years in a row ending in 2006. Note that this is for living a Western corporate executive lifestyle. Many Japanese get by fine on a budget in Tokyo, underpinning the high national savings rate. The Tokyo Stock Exchange is the second largest in the world currently by market capitalization of listed shares, at more than $4 trillion. Only the New York Stock Exchange is larger. However, its prominence has fallen significantly since early 1990's asset bubble peak, when it accounted for more than 60 percent of the entire world's stock market values. Tokyo had 8,460 ha (20,900 acres) of agricultural land as of 2003 , according to the Ministry of Agriculture, Forestry and Fisheries, placing it last among the nation's prefectures. The farmland is concentrated in Western Tokyo. Perishables such as vegetables, fruits, and flowers can be conveniently shipped to the markets in the eastern part of the prefecture. Japanese leaf spinach and spinach are the most important vegetables; as of 2000, Tokyo supplied 32.5% of the Japanese leaf spinach sold at its central produce market. With 36% of its area covered by forest, Tokyo has extensive growths cryptomeria and Japanese cypress, especially in the mountainous western communities of Akiruno, Ome, Okutama, Hachioji, Hinode, and Hinohara. Decreases in the price of lumber, increases in the cost of production, and advancing old age among the forestry population have resulted in a decline in Tokyo's output. In addition, pollen, especially from cryptomeria, is a major allergen for the nearby population centers. Tokyo Bay was once a major source of fish. 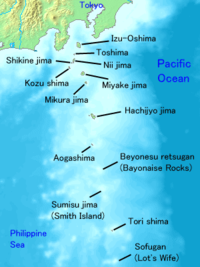 Presently, most of Tokyo's fish production comes from the outer islands, such as Izu Ōshima and Hachijōjima. Skipjack tuna, nori, and aji are among the ocean products. As one of the major cities of the world, Tokyo has over eight million people living within its 23 wards, and during the daytime, the population swells by over 2.5 million as workers and students commute from adjacent areas. This effect is even more pronounced in the three central wards of Chiyoda, Chūō, and Minato, whose collective population is less than 300,000 at night, but over two million during the day. 1 as of October 1, 2003. 2 as of January 1, 2003. The five most common foreign nationalities found in Tokyo are Chinese (120,331), Korean (103,191), Philippine (31,505), American (18,043) and British (7,585). Map of Tokyo Subway system, with transfer stations labeled. Tokyo is Japan's largest domestic and international hub for rail, ground, and air transportation. 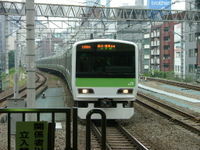 Public transportation within Tokyo is dominated by an extensive network of clean and efficient, if often very crowded trains and subways run by a variety of operators, with buses, monorails and trams playing a secondary role. Railway stations are not only transport, but the centre of Tokyo and Japanese urban life, as everything is judged in relation to it, taking on the significance of highways in the United States and elsewhere. Rail is the primary mode of transportation in Tokyo, which has the most extensive urban railway network in the world and an equally extensive network of surface lines. JR East operates Tokyo's largest railway network, including the Yamanote Line loop that circles the centre of downtown Tokyo. Tokyo Metro and Tokyo Metropolitan Bureau of Transportation operate the subway network. The metropolitan government and private carriers operate bus routes. Local, regional, and national services are available, with major terminals at the giant railroad stations, including Tokyo and Shinjuku. Being the nation's centre of education, Tokyo has many universities, junior colleges, and vocational schools. Many of Japan's most prestigious universities are in Tokyo. The most prestigious is the University of Tokyo. Other schools include Keio University, Hitotsubashi University, and Waseda University. Tokyo also has a few universities well-known for classes instructed in English. They include International Christian University, Sophia University, and Temple University Japan. Tokyo has an array of Japanese universities. National universities include Tokyo Medical and Dental University, University of Electro-Communications, Tokyo Institute of Technology and University of Tokyo. There is only one public university, the Tokyo Metropolitan University, and Private Universities include, Asia University, Tokyo University of Science, Toyo University and Seijo University. For an extensive list of universities in Tokyo, see List of universities in Tokyo. Publicly run kindergartens, elementary schools (years 1 through 6), and junior high schools (7 through 9) are operated by local wards or municipal offices. Public high schools in Tokyo are run by the Tokyo Metropolitan Government Board of Education and are called "Metropolitan High Schools". Tokyo also has a great number of privately run schools from kindergarten through high school. For a list of high schools in Japanese, see . The Meiji Shrine was built as a memorial to Emperor Meiji, who ruled Japan from 1867 to 1912. Located west of central Tokyo, the shrine is sorrounded by wooded grounds that feature thousands of trees from all over Japan. Tokyo is known for its many museums. Located in Ueno Park are the Tokyo National Museum, the country's largest museum and specializing in traditional Japanese art; the National Museum of Western Art; and the Tokyo Metropolitan Art Museum, which contains collections of Japanese modern art as well as over 10,000 Japanese and foreign films. Ueno Park also contains the National Museum of Science and the municipal zoo. Other museums include the Nezu Art Museum in Aoyama; the Edo-Tokyo Museum in the Sumida Ward across the Sumida River from the centre of Tokyo; and the National Diet Library, National Archives, and the National Museum of Modern Art which are located near the Imperial Palace. Tokyo is the national centre of performing arts as well. There are many theatres in the city in which traditional forms of Japanese drama (like nō and kabuki as well as modern dramas. Symphony orchestras and other musical organizations perform Western and traditional music. People enjoying the cherry blossoms in Ueno Park. Tokyo is home to many different festivals that occur throughout the city. Major festivals draw people from all over the city including the Sanno Festival at Hie Shrine, and the Sanja Festival at Asakusa Shrine. Many Japanese cities hold festivals called matsuri. The Kanda Matsuri in Tokyo is held every two years in May. The festival features a parade with elaborately decorated floats and thousands of people. Annualy on the last Saturday of July, a enormous fireworks display is held over the Sumida River and it attracts over 1 million viewers. 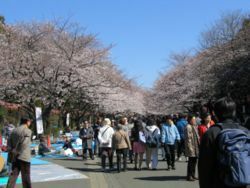 Once cherry blossoms bloom in spring, many residents gather in parks such as Ueno Park, Inokashira Park, and the Shinjuku Gyöen National Gardens for picnics under the beautiful cherry trees. Tokyo has many tourist sightseeing, cultural and sport attractions. These include famous temples, shrines, annual festivals and events, parks, scenic views, popular shopping and nightlife districts. Cultural highlights of Tokyo include museums, concert halls, and theaters.